Shutters are the most practical way to have complete control over your privacy and the amount of natural light entering a room. Stylish and versatile, they can be used in a range of situations from bay windows and patio doors to room dividers and wardrobe doors. Choose from a variety of styles, colours and materials to complement the architecture of your windows and provide a perfect finish to any interior design. The timber creates a barrier around the window for insulation, keeping your room warmer during the winter. In the summer, open windows and closed shutters can allow air to circulate and keep the room cool. When the panels and louvres are closed, sound insulation from outdoors is provided. The louvres on shutters can be angled in different ways to control the light, and the panels can be fully opened to allow maximum light and views. With flexible lighting control, harmful UV rays will not be entering directly into the room, protecting flooring and furniture. The shutters are coated with a layer of UV protection that protects against warping and the stain or paint fading. With shutters there are many ways to maintain privacy and security whilst still allowing the light to enter your property. Panels can be closed independently and louvres can be manoeuvred in different ways to control light and maintain privacy. 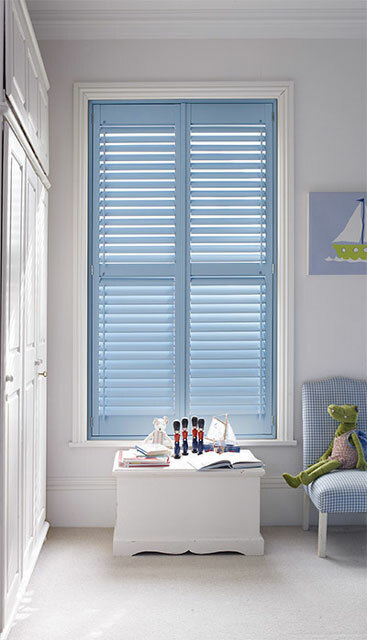 Unlike other window dressings, shutters are easy to maintain and only require a wipe down every now and again. They do not collect dust like blinds and curtains, so are ideal for keeping out dust mites. At Lotiss Interiors we have a range of designs to choose from to suit your window and your home. From classic to contemporary, the shutter designs on offer are certain to bring sophistication to your home. Shutters are a desired window covering by many homeowners so are a great investment to a property. Improve curb appeal by disguising PVC windows and increase the value of your property. Sourced in North America, Basswood is a hardwood that provides excellent stability and high density from the closely spaced growth rings. Due to this reason, it is ideal for larger installations or high traffic areas as it has additional strength over other hardwoods. Otherwise known as Lime, Linden or Tilia wood, Basswood is lightweight and high quality with a consistent, smooth grain which makes it perfect to paint. The likelihood of the timber warping is low due to its engineered core, providing exceptional dimensional stability. Mortice and tenon joinery is used on all of our wooden shutters. Before going through the machine process, every shutter is extensively kiln dried. Originating in North Asia, Paulownia is a hardwood that is lightweight, strong and fast growing. With a full FSC certification, the Paulownia timber we used comes from a certified sustainable source. Compared to Basswood, Paulownia is somewhat less dense due to the growth rings in the wood being widely spaced. To compensate, the timber is treated with a specialised coating before it is passed through our advanced painting process. The wood is ideal for both painting and staining to a high quality. This is due to the low oil content, smooth grain texture and knot-free appearance. Like Basswood, Paulownia has outstanding dimensional stability so the risk of warping is reduced. Every part of the shutter, including the top and bottom rails, mid rails, stile, louvres, and frame, are made from Paulownia. There is a slight difference with the style of the clear view rods for opening and closing the louvres on the Paulownia shutters compared to the others in our range, to allow for a smoother movement and reduce strain on the wood. Best suited for places with a lot of moisture, such as bathrooms and wetrooms, our UPVC shutters are completely waterproof. They are more suitable for rooms where hygiene is central. 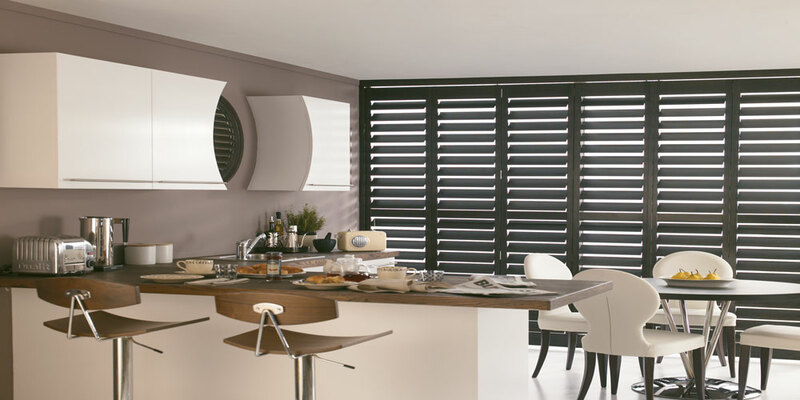 Produced using man made materials; these shutters offer a smoother finish and will last longer than wooden shutters. UPVC shutters will never flake, warp or peel, plus they have an exceptional temperature operating range. This option allows separate parts of the shutter to be tilted individually, offering more light control. For example, open the top section to allow sunlight to brighten the room, whilst the lower section is closed for privacy. For a sleek, modern look, choose between the ‘Hidden Tilt Rod’ or ‘Clearview’ options to open the louvres. If you want a more classic style, opt for the ‘Central Tilt Rod’ or ‘Offset Tilt Rod’. There is also an option to include a darkening blind that is fitted behind the shutters. This can help to block any light entering the room, no matter what time of day. Alton, Ascot, Bagshot, Basingstoke, Beaconsfield, Binfield, Blackwater, Bracknell, Camberley, Crowthorne, Chertsey, Chobham, Egham, Epson, Farnborough, Farnham, Finchampstead, Fleet, Frimley, Gerrards Cross, Guildford, Hartley Wintney, Haslemere, Henley-on-Thames, High Wycombe, Hook, Kingston Upon Thames, Lightwater, Maidenhead, Marlow, Newbury, Hampshire, Richmond, Reading, Sandhurst, Sunningdale, Sunninghill, Twickenham, Twyford, Virginia Water, Walton-on-Thames, Weybridge, Windlesham, Windsor, Woking, Wokingham, Yateley, and everywhere in between.